Parramatta Heritage: Parramatta High School celebrates 100 years! Before the year draws to a close, we should wish Parramatta High School happy 100th birthday! This historic school began its life in 1913 and has been an important educator of the young adults of Parramatta ever since. 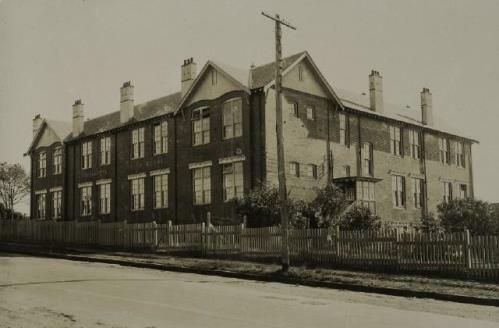 On 28 January 1913, the school opened in temporary accommodation at Macquarie and Jubilee halls where five classes were held, each separated only by calico curtains. Student fashion was quite formal with men wearing suits and hats, and women wearing long skirts. Many of the 190 students were from the Parramatta area but others were from as far afield as Blue Mountains, Mittagong and Epping. Australia was getting used to being a federation and in these early years the concept of a Government funded high school was relatively new. Compulsory education was introduced in the 1870s but was difficult to enforce and the depression of the 1890s saw many children forced to work rather than going to school. It was the early 1900s that saw more regular attendance at school became typical in the area. World War One preoccupied much of the school’s first decade and many staff and students went off to War. Parramatta High was the first co-educational school in the state and many of its first dux students were female. Although both boys and girls were prefects from 1913, it wasn't until the 1920s that there was a female school captain. in the 1920s and 1930s the school cemented its own identity. Especially on show was its sporting prowess on the soccer field which was the boys main winter sport. The girls played basketball, hockey and vigoro but now both play a wide range of sports, regardless of gender. The 1940s and 50s saw strong gender demarcation lines between boys and girls as the day to day practice at the school meant staff rooms were divided along gender lines and there were separate lunch areas for boys and girls in the playground. Even so there was strong school spirit and pride in being the only coeducational school in Sydney and the demarcation lines gradually relaxed during the 1960s and 1970s. The school’s impressive collection of archival material reflects the Parramatta area with around 60 different ethnic groups represented in the school body. Many of these migrated to Australia as refugees and have added a wonderful layer to the school. It introduced a selective stream in 2010 and students for this are drawn from surrounding areas to join local students bringing the student body to over 800.